Last night the boys got into the sort of mischief I like to see them get into. The sort where there is a little bit of trouble, but not real trouble and there's nothing actually WRONG with what they're doing. Not to mention they're actually working together and having fun. So instead of stopping them I just took some pictures and laughed along with them. O has his first official loose tooth and G convinced him to try the whole tie a string around it and the door knob then slam the door. In case you were wondering.....it didn't work. 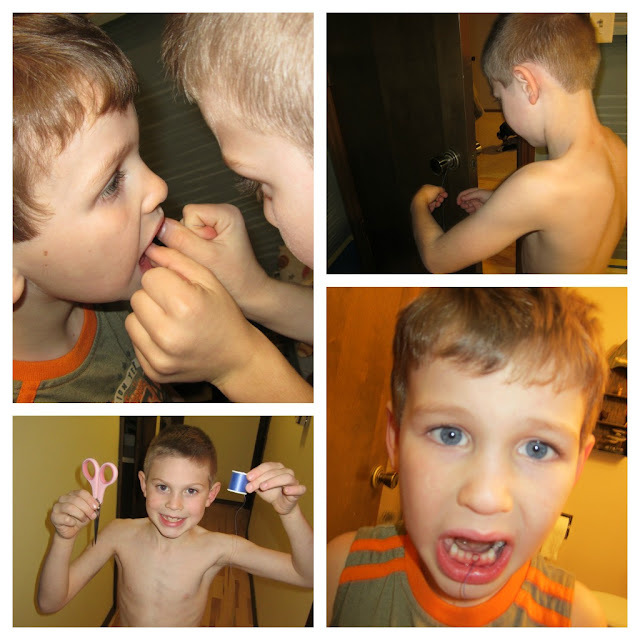 That is one brave little boy with a loose tooth!!! Thanks for the kind words on my post...a happy Thanksgiving to you and your family!